The biggest study of the controversial MMR vaccine says the vaccine is safe to give to children. Government health experts say the research simply rubber stamps their view that the vaccine is completely safe. However, separate studies claim the vaccine was not properly tested before introduction, and that some doctors and nurses are reluctant to give a second booster jab. Around 2,000 families in Britain have taken legal action claiming their children have been damaged by the jab, with many believing it has triggered autism. Some parents want the three vaccinations to be available separately. Researchers in Finland followed nearly two million children for 14 years after they were given the measles, mumps and rubella injection. They found no link between the vaccine with autism or bowel disease, which has also been linked with the vaccine. Writing in the Pediatric Infectious Disease Journal, the scientists concluded: "Comprehensive analysis of the reported adverse reactions established that serious events causally related to the MMR vaccine are rare and greatly outweighed by the risks of natural MMR diseases." The research findings come just days after government experts warned the UK was at risk of a potentially fatal outbreak of measles because immunisation levels had dropped dramatically. However, a separate study claims that the vaccine was not adequately tested before it was introduced. This study is being published by Dr Andrew Wakefield, of London's Royal Free Hospital, who sparked the controversy surrounding the vaccine with a previous report saying some children developed symptoms of autism after receiving the jab. Dr Wakefield's work has been rejected by two expert panels that advise the government. 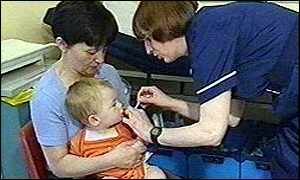 Meanwhile, a third report in the British Medical Journal suggests that half of doctors, nurses and health visitors have "reservations" about giving toddlers the second MMR jab. A significant proportion of practice nurses surveyed believed that the vaccination could be linked with either autism or bowel disease. However, doctors were more concerned about the timing of the second jab, rather than its safety. The second vaccination, is given at around four-years-old. In the survey, 48% of health professionals questioned said they had reservations, and 3% disagreed with the policy of giving the jab. 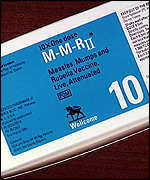 The first MMR vaccination is given to children aged between 12 and 15 months. The second vaccination is intended to catch out those who missed out on the first round of jabs, and those for whom the first vaccination did not work. North Wales public health doctors who carried out the study are calling for better education for health professionals in the light of the recently reported falling uptake of the MMR vaccine. Immunisation levels in some parts of the country have reportedly fallen below 75%. The World Health Organization suggests a threshold of 95% to guarantee "hard immunity" for the whole population. The researchers surveyed almost 600 health professionals in North Wales in 1998, asking questions about their knowledge, attitudes and practices regarding MMR vaccination. They say that knowledge about the second MMR dose varies considerably. Dr Marko Petrovic, the public health doctor for the North Wales Health Authority who led the research, said the survey may have been affected by scares linking MMR to serious illnesses. But he said most objections had been on the basis of giving two separate injections to four-year-olds - something he said could be solved by bringing the MMR jab forward. A Department of Health spokesman said: "In this study, which was carried out over two years ago, GPs are not questioning the giving of the MMR vaccine. "The study highlights that some health professionals lacked awareness of up-to-date information on the rationale for the second dose of MMR." Dr David Salisbury, head government's immunisation programme, urged parents to get their children immunised with the MMR vaccine. He told the BBC: "Every single one of these concerns has been looked at in great detail over and over again. "All of the research says this is a safe vaccine." He dismissed the idea that children would be better off receiving separate vaccines for measles, mumps and rubella as the gap required between each vaccine would leave children at risk for a longer time. Anne Coote, a founder member of the pressure group Jabs, said the number of contrasting reports published on the subject put parents in a difficult position. "There's lots of reports that keep coming out, and this is the problem. "The government will fetch out one report to say that MMR is fine and they've not got a problem with it, and then some other medical researcher will come out and say there's a suspicion about MMR and more research needs to be done, so the parent is piggy-in-the-middle." Shadow Health Secretary Dr Liam Fox said it was important MMR immunisation rates were increased to prevent an epidemic. 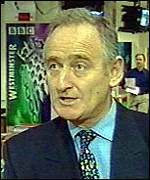 He accused the government of failing to reassure the public adequately. Roger Goss, of the pressure group Patient Concern, said: "The government position is irresponsible. It must either make having an MMR innoculation legally compulsory or making the single shot vaccine available for the children of those parents who want it."